Cosmetics include all sorts of substances that are applied to different parts of the human body for enhancing people’s appearance, for skin-, hair- and nail-care, and for cleansing purposes. 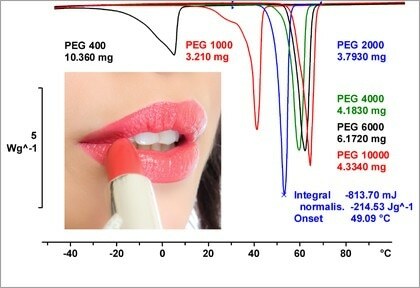 This webinar presents a number of interesting application examples that demonstrate the use of thermal analysis techniques in the cosmetics industry. The applications have to do with the measurement of the physical properties and behavior of cosmetic preparations as a function of temperature and include melting, content determination, denaturation studies, curing reactions, and loss on drying. The most important effects that can be analyzed by DSC are the melting point, melting range, and melting behavior. For TGA, the main applications are evaporation, content determination and filler determination. A Dropping Point or DP instrument is used to detect the dropping point of waxes. A Melting Point or MP instrument is used for automatic melting point determination and melting range detection.